This post was written by Nupur Sonar  and originally appeared on Video Volunteers, an award-winning international community media organization based in India. 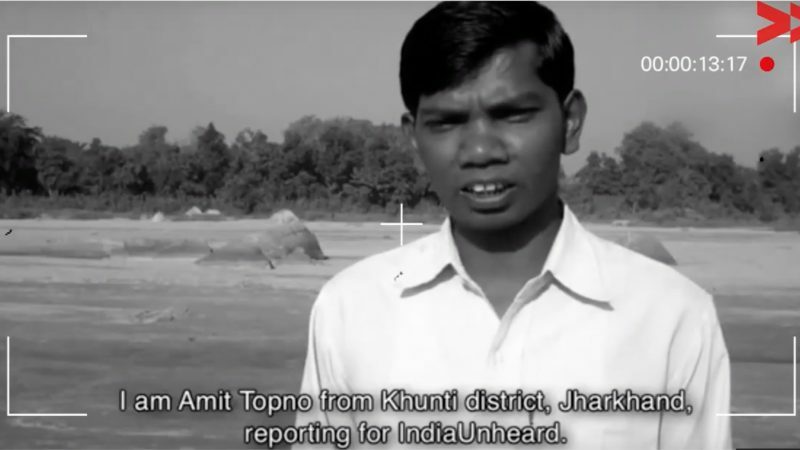 In the early hours of 9 December 2018, Video Volunteer Community Correspondent Amit Topno was found murdered  in Ghaghra area of Jharkhand , India. Topno, an Adivasi  (indigenous) inhabitant of the conflict-prone region of Khunti , Jharkhand, had been with Video Volunteers (VV) since 2012, reported for Newscode and OK Times, and most recently drove a taxi for Ola Cab. Topno reported fearlessly on issues like sand mining, illegal alcohol sales, Adivasi rights, education, sanitation, human trafficking, land rights, culture and most recently the Pathalgadi movement. His last report for VV was produced six months ago on the Pathalgadi , a movement in which Adivasi communities across Jharkhand and Chhattisgarh asserted their right to self-governance. The movement has its roots in creating awareness and ensuring implementation of the key provisions of the Panchayats (Extensions Scheduled Areas) Act, 1996 that empower a village as an administrative unit. Jharkhand is a land caught up in a frightful storm. Its people are being whirled around in a storm of starvation, conflict, and poverty. I am the headman of my village, Nichitpur, Jharkhand, and I’m tired of seeing my people die,” said Amit in an interview in 2014. Topno’s body was found on the Namkum-Doranda road in Ranchi  on 9 December. The autopsy report reveals that he was shot twice and one of the bullets was still lodged in. The autopsy report also states that there were no signs of struggle or scuffle, not even a scratch. His taxi, phone and identity cards were missing but money was not. No weapon was recovered from the scene of the crime. All of this points to a pre-meditated and professionally executed murder. Over 11 days have passed since his murder and no arrests have been made in the case yet — though the police have said that they are closing on some leads. On 15 December 2018, a delegation of civil society organisations including VV met the superintendent of police and urged him to conduct a thorough and speedy investigation into Topno’s murder. The SSP assured that all possible angles will be investigated. On 17 December 2018, the Jharkhand Jantantrik Mahasabha organised a peaceful protest in Jamshedpur . Friends and allies of Amit also submitted an application to the National Scheduled Tribe Commission urging them to take note of the gruesome murder. Civil society organisations appraised this matter to the Chief Secretary of Jharkhand government and other ministers on 19 December 2018. Arup Chatterjee, an MLA from Nirsa Dhanbad, was handed over documents related to Topno’s work and he has promised to raise the issue in the upcoming winter session of the assembly starting on 24th December. Though Topno did not inform his colleagues of any threats to him in the last 18 months, it cannot be ruled out that he was murdered because of his work as a journalist and social activist, raising issues affecting communities on the margins and working in an area where conflict over land resources is rife. In November 2018, another journalist from the same area was murdered. At a time when India ranks 14th on the Global Impunity Index, Topno’s murder is a reminder that journalists who speak truth to power and report out of remote, rural areas are not safe.